At Lucideon we understand that organizations are faced with increasingly complex issues, from current and impending legislation to improving efficiency, performance and profit. Becoming a Technology Partner helps you to meet these challenges head on. Using our unique expertise, information resources and cross-industry knowledge we can help you to both develop new products and technologies and solve those niggling day-to-day problems. A Technology Partnership has already benefited hundreds of companies. Use Lucideon as an additional knowledge centre or an extended technical network. Our experts understand your business, industry and challenges, helping you to work through technical issues, improve products and processes, and innovate around the products of the future. Stay ahead of the field with our Information Service. With tailored alerts to your inbox, a comprehensive search service and 24/7 access to our World Ceramics Abstracts database, we can help you to source all the ceramics and materials information you need. As well as making the most of our insights, information and expertise, you’ll also receive benefits that impact your bottom line, including testing and training discounts, banked allowances as part of your subscription, and networking. Interested in Training? Find out more about our Training Courses here and how you can access these as a Technology Partner. Whether you are a manufacturer of ceramic whitewares, refractories, industrial ceramics or heavy clay products, a supplier to these sectors, or a tabletop retailer, you can choose the Technology Partnership Package that best suits your organization. Packages range from our entry level information associate package to executive level partner packages. Interested in becoming a Technology Partner or simply want to find out more? Contact Caroline Mullington, Technology Partnership Manager - caroline.mullington@lucideon.com or +44 (0)1782 764422. 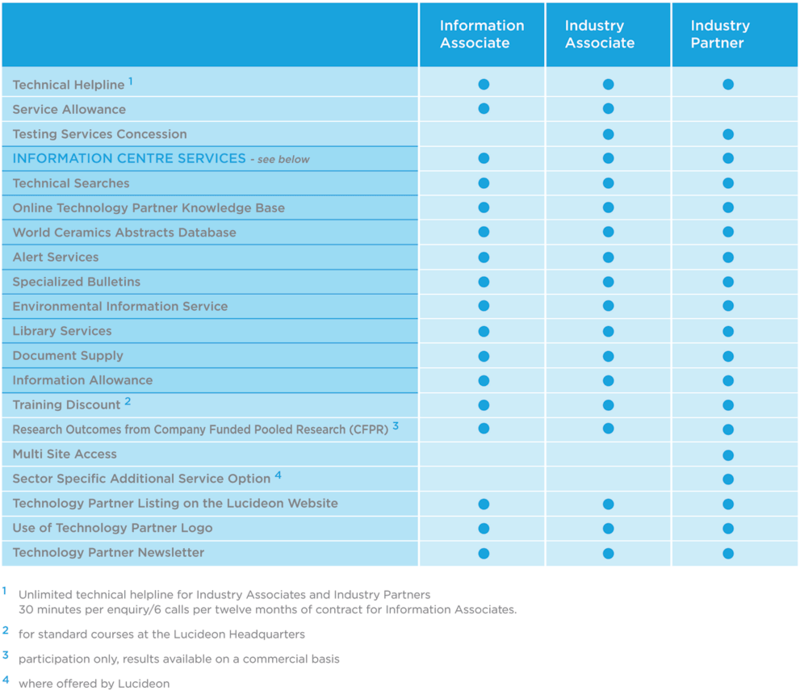 List of Lucideon's Technology Partners.